I am not a fan of Brett Kavanaugh (above). I just want to make that clear from at the outset. I was willing to give him a fair hearing, despite disagreeing with many of his decisions from the bench. He ruled against an immigrant teen seeking an abortion. He wrote a dissenting opinion regarding Occupational Security and Health Administration (OSHA), trying to impose rules on SeaWorld. He has made it clear a sitting president should be exempt from indictment. 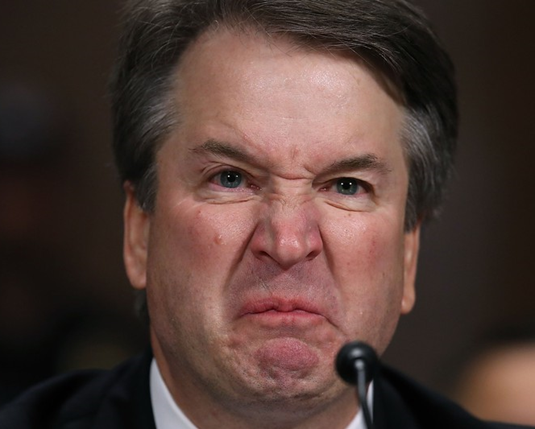 Brett Kavanaugh is not my favourite fellow. If he could show himself devoted to the Constitution, I could understand the Senate ratifying him. After all, the Supreme Court of the United States (SCOTUS) is ostensibly balanced and representative of a variety of views. For me, the key element, of the Supreme Court, is that it’s a group of thoughtful and considerate jurists. They follow the Constitution, not their personal views nor any political philosophy or agenda; aren’t ideologues. It’s because of these final points that I cannot support Kavanaugh. First, let’s address a very important issue: lying under oath. The judge stated that he drank beer when he was in high school and was eighteen years of age, and, most important, it was legal for him to do so. He’s wrong. It’s a bold-faced, blatant lie. The drinking age was twenty-one in Maryland back when he was in high school. There’s no doubt he knew the legal age for drinking in Maryland. Now, if he’d said that, admitted to underage drinking and offered a simple apology, I could have chalked it up to youthful indiscretion and let it go. As a youth, I drank some beer, but didn’t like it. I had wine at special occasions with my family. I even smoked. Kavanaugh lacked contrition for his actions. He lied with the expectation that people would either accept it or ignore it. I will not. Kavanaugh reeks of White Privilege. Now, I know teenage drinking might seem a minor issue, but I look at what it indicates regarding his character. He clearly feels no remorse, no concern about his honour or dignity and he has contempt for anyone that might think to check on his story. His defence sounds a great deal like White Privilege. Back during the Clinton impeachment trials, Nick, my nephew, was adamant that impeaching Clinton was imperative. It wasn’t that Clinton engaged in an affair, with an intern, which troubled Nick. No, it was that he lied about it. I pointed out to Nick that a politician lying about his sexual activities was practically a given. Most of the Republican men, who were denouncing Clinton the loudest, were probably the worst offenders in that category. That didn’t matter to Nick. Clinton lied. Therefore, impeachment was necessary. I sighed. Rolled my eyes and moved on. As I recall, most of Europe was laughing at us over that one. Yet now, given the circumstances surrounding Kavanaugh, I do see the importance of fixating on the issue of lying. If Kavanaugh tells lies regarding something unimportant, such a teenager partying, what other values does he de-emphasise? How will he respond when something is truly critical to the nation? Finally, his very political, nay ideological, rant, before the senate judiciary committee troubled me. Kavanaugh sounded much as Trump when he spoke of the 2016 election and a Justice on the Supreme Court should be above such things. Of all the branches of our government, the highest and most non-political must be the Supreme Court. They are, after all, the ones charged with interpreting the very foundation of our nation. This is another reason to vote. In good conscience, I cannot support his placement to the court. Mind you, I still think his confirmation is a good bet. The republicans are far too craven to stand up to Trump or their base, which means we’re going to be dealing with this man for decades to come. Here is yet another lesson that underscores the importance of voting.